There’s no way to force iCloud Photo Library to recognize existing media, but you can pause or stop the uploads. Photos reports that it is still uploading 11,655 items. I checked my iCloud account online and it shows just over 15,000 items, so at least it is not adding duplicate items to iCloud. Do you have any idea why the Photos app is uploading files that have already been uploaded and is there anyway to stop it? First off, I’m sure Luminar isn’t at fault. Photos extension don’t interact with iCloud Photo Library and only modify images that you edit with them. The timing is almost certainly coincidental. The fact that you’re not getting duplicates in the uploads would confirm that. I saw something similar when I was testing a scenario for a Mac 911 column that ran in November, “What to do when Apple tells you there’s not enough storage to re-sync iCloud Photo Library.” Despite all the photos being in iCloud, Photos still either uploaded each of them or went through a very slow process of validating that each image and video was identical in an 115GB set. I’m fortunate enough to have gigabit Internet, but it was still a colossal waste of bandwidth and time. 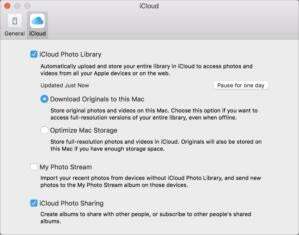 It’s possible your iCloud Photo Library status was bumped without your intent, and it forced a restart. This might happen if you log out in iCloud preference pane from one Apple ID and log in with another. The current status of iCloud Photo Library is found in Photos > Preferences in the iCloud view. You can pause or disable iCloud Photo Library syncing. Since you have most of the images left to re-sync, you could disable iCloud Photo Library in the preferences in Photos noted above, and wait until you’re home to enable it again. This will duplicate some effort, but it’s the least annoying course of action. Or, in that preference view, there’s a Pause for One Day button. You can click that and set yourself a daily reminder to click it again until you’re back home. You could also use the Terminal to kill off some iCloud synchronization agents that run in the background—just quitting Photos doesn’t halt uploading—but I don’t recommend it. That will disrupt other iCloud operations and these agents can restart on their own when macOS recognizes they’re not running.